The financial economy has done well for owners for 50 years ... but other dimensions of performance, not so good. The takeaway from the following graphs is that decision makers have been able to make decisions that delivered benefit to owners (investors) while the population that works in the USA (and other mature Western democracies) has been increasingly disadvantaged compared to prior decades. This is the result that one must expect as long as the dominent measure of economic success is money profit and money wealth accumulation. 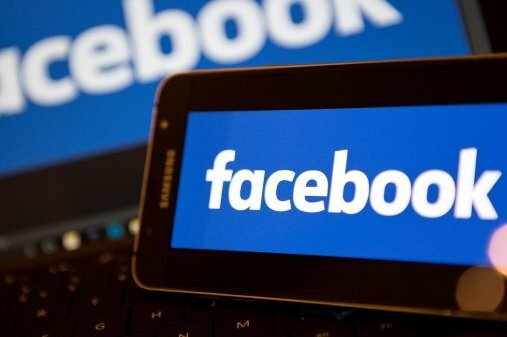 It confirms the hypothesis that in order for the economy to be optimized for ALL the population there must be measures to reflect quality of life for everyone, and not merely a single simple measure that really only works for those with affluence. In other words, the top purpose of economic activity should be betterment for people, with the least possible damage to the environment and least degradation of created capital ... and the metrics should reflect this purpose! GDP is a measure that sends all the wrong signals about economic performance in any mature economy ... though there is a strong correlation between GDP and quality of life in poor developing economies. After the 1970s GDP has proved to be a bad proxy for quality of life in rich mature economies like the United States, Canada, many countries in Europe, and Japan. After 1980, there was a new political imperative ... 'Reagonomics' ... where deregulation and profit became the dominant policy rather than a more balanced set of socio-economic goals. The cost push inflation of the 1970s was ended in large part by the expansion of offshore manufacturing especially in China and an offsetting reduction of high wage US manufacturing. 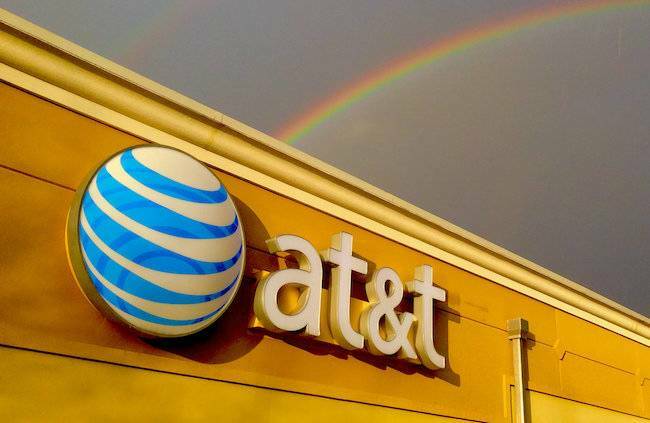 This resulted in much improved profit performance, while causing considerable social disuption with substantial social damage in the United States and significant poverty reduction in low wage cost countries like China and some others mainly in Asia. 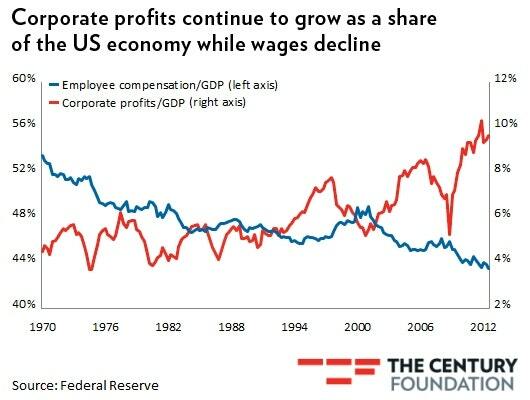 For almost 40 years since 1980 years there have been corporate profit increases, but almost no increases in wages! 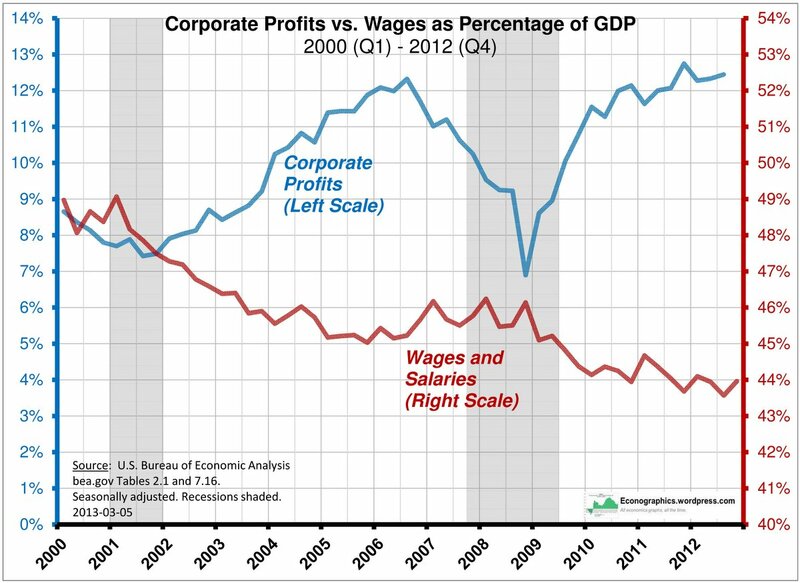 Corporate Profits -v - Wages as a percent (%) of GDP! This graph shows that relative to GDP, there has been a continuous trend of wage decline since 1970. 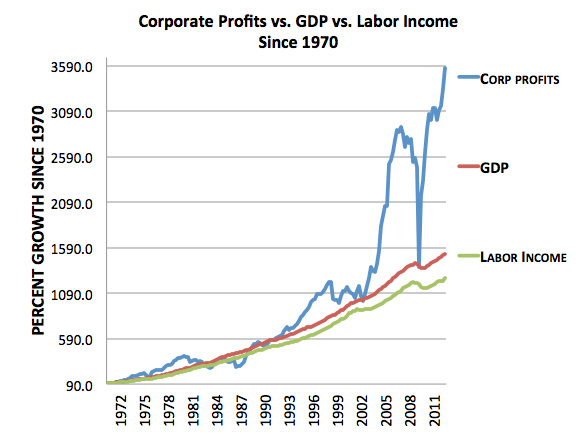 Corporate profits did not improve in the 1970s. At the end of the 1970s the economic situation was very tense with inflation out of control and interest rates around 20%. This situation was stabilized in the early 1980s and by the 1990s profits relative to GDP started to increase and this trend continued until 2012 with a downward blip around 2000 with the 'dot com bust' and a bigger blib as a result of the financial crisis on 2008. There has been a continuous trend of wage decline since 1970. There was a modest improvement in the wage situation in the 1990s prior to the 'dot com bust', but since then the wage decline relative to GDP accelerated. 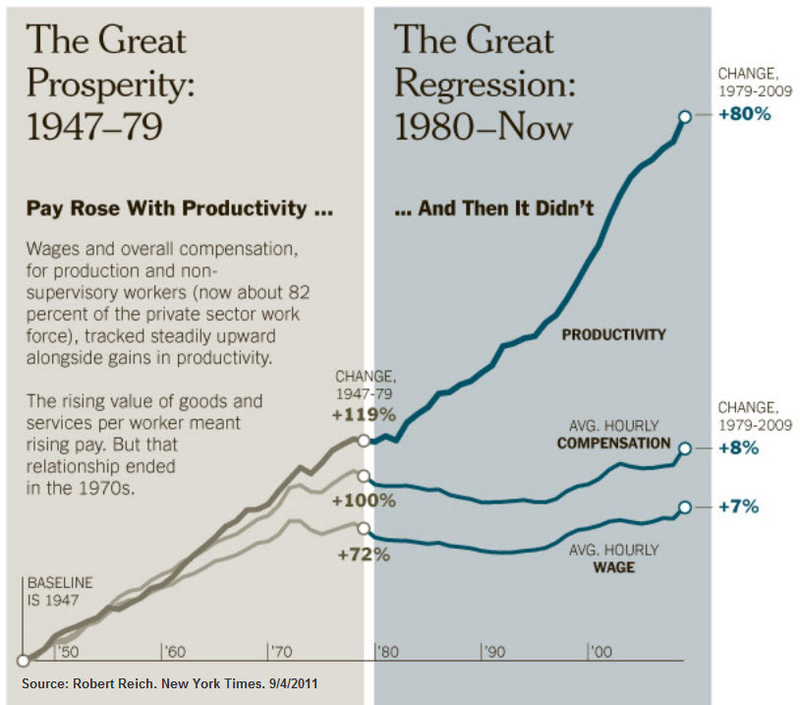 50 years of increase in productivity and profits, little or no increase in wages! A plot of productivity versus wage growth shows that since about 1975 NONE of the benefit of increased productivity has gone to improving wages ... ALL of it has gone to profits and to the benefit of owners. This graphic prepared by Secretary Reich in 2011 shows the same basic information ... that NONE of the benefit of increased productivity has gone to improving wages ... ALL of it has gone to profits and to the benefit of owners. For more than 30 years all the benefits of improved productivity has gone to owners, with none going to those that work. 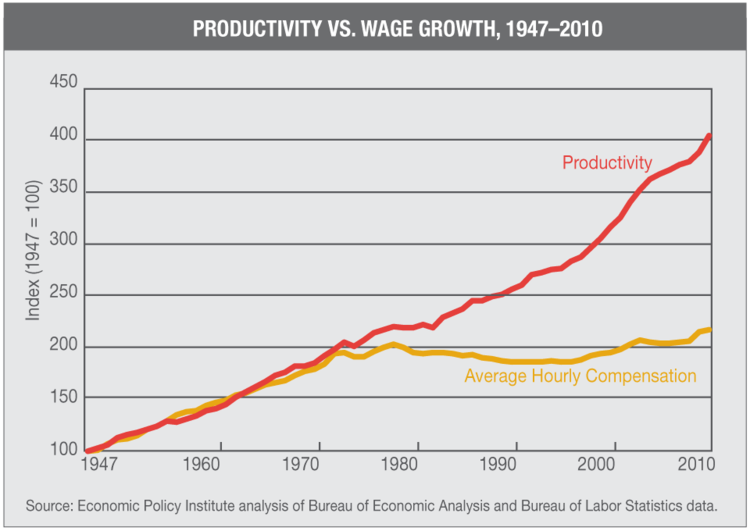 In contrast, in the period 1945 to 1980 the growth of productivity was shared equitably between investors and workers. 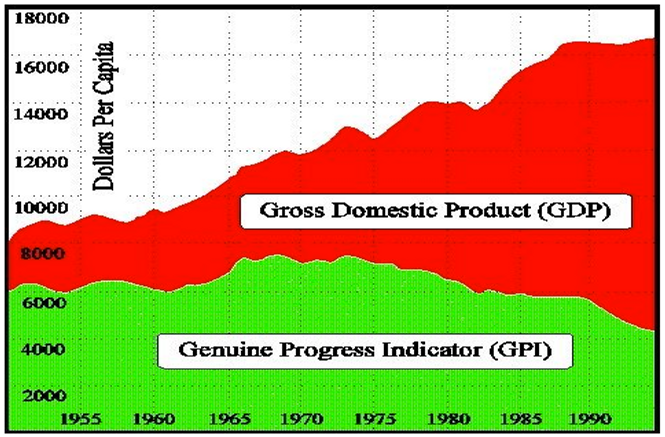 For the period 1970 to 1985, GDP has increased modestly year over year with a modest pull-back in 2008 due to the financial crisis. Labor income has has also increased over the same time period. For the period 1970 to 1987 corporate profits increased very little, but after this profits increased substantially. There were short blips in the profit increase trajectory during the dot com bust around 2000, and a bigger one caused by the financial crisis of 2008. 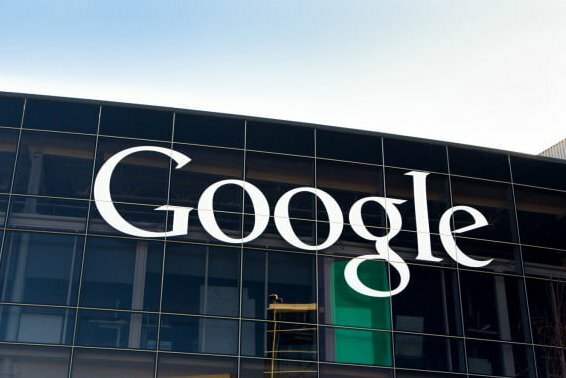 What has Caused Inequality? How Can it be Fixed? The root cause of inequality is very simple. The people at the top are getting paid too much, and the people at the bottom are being paid too little. Why has this not been happening? The people at the top are making all the decisions, and the decisions are always in their own best interest. This is unsustainable ... and some guts from leadership is urgently required. There is not much evidence of this now or for the past several decades! This set of data (from Andrew McAfee) shows a modest growth in GDP for the USA from 1995 to 2011. 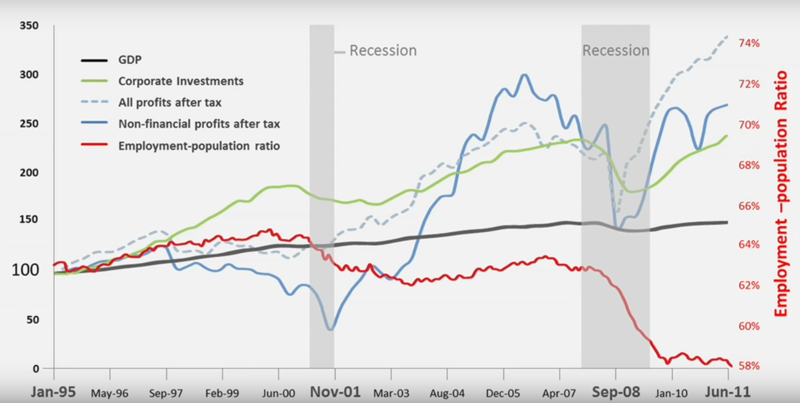 In this period corporate investment increased but dropped as the economy went into a short recession after the post Y2K tech boom and again in the so called 'great recession' of the period 2007/8/9. Non financial profits after tax has grown stongly from 1995 to 205 but with signficiant fluctuations with big drops in the 2000 recession and again in the great recession a few years later. 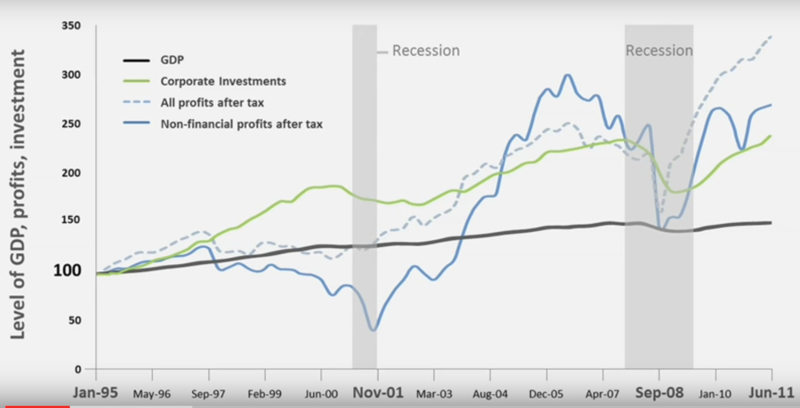 Total profits after tax did not fluctuate as much as the financial sector fluctuated less even though it had a huge role in the financial crisis that was responsible for the great recession. None of these economic indicators suggests an economy and a society in trouble ... rather it looks like a set of trends that are really quite good. The problem is that when the productivity / worker trends are added in (the red line) then it shows that the achievements of the economy are being obtained with less and less participation of workers. It comes as no surprise that a political candidate such as Donald Trump is able to attract votes based on a promise of change, when a very large proportion of the country's workers are 'losing' relative to the more advantaged in the society. This is very basic economic analysis that seems to have been ignorded by politicians, policy makers and the media for a very long time. A big part of the wealth of the United States has been created not so much by the ownership of physical assets, but by the ownership of financial assets. 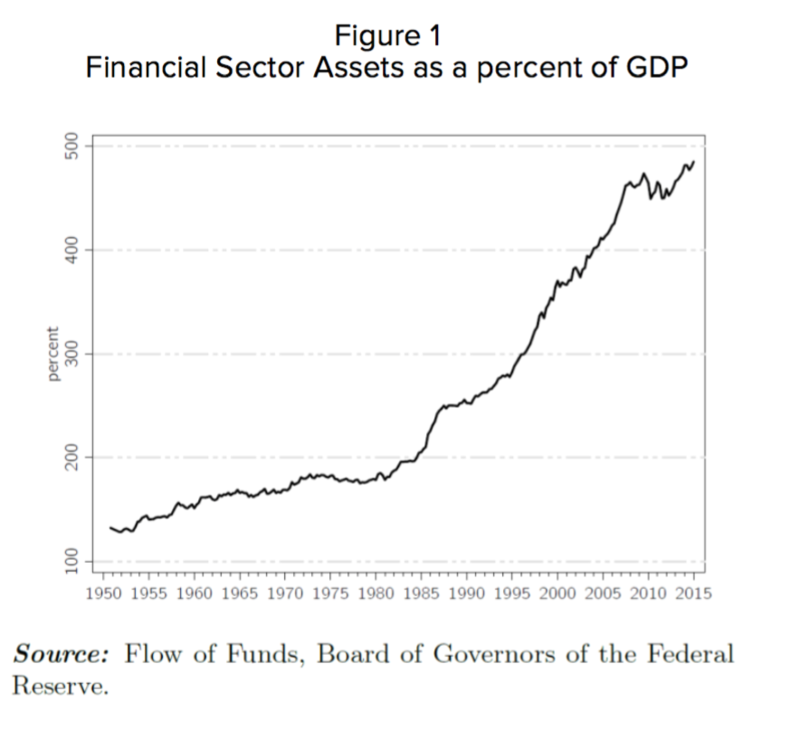 From 1950 to 1980 there was a relatively slow increase in financial assets relative to the growth of GDP, but in the four decades since 1980 the increase in financial assets has been very rapid. This has been the result of financial engineering rather than much investment and growth in the real assets of the economy that are essential for a sustainable future. The changes in the structure of development financial flows over the past 40 years mean that developing countries are going to be less and less able to achieve independent sustainability. 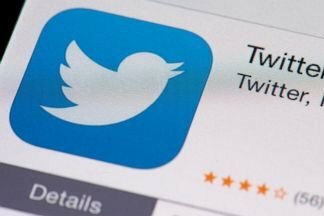 This outht to be a matter of great concern, but the discussion is muted. 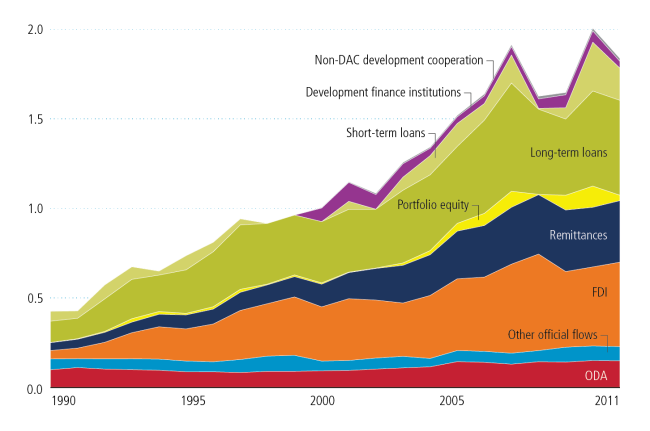 Official Development Assistance (ODA) has remained at about the same level of several decades. However, various forms of debt financing and foreign direct investment have increased substantially. The expectation with these modes of financing is that there will be a 'return' from these investments that is a risk adjusted market rate. In most cases this will be substantially more than the underlying increase in the productivity and performance of the economy ... and the basic arithmetic is that the country gets pooer rather than richer as a result of the financial interevention. The good news is that international remittances have grown substantially. These fund flows have a very positive impact on the quality of life of the beneficiaries. Sadly remittances are also the target of politicians who have an interest in taxing these fund flows. Some economists attribute the decline in value of the dollar to the creation of the Federal Reserve Bank in 2013. 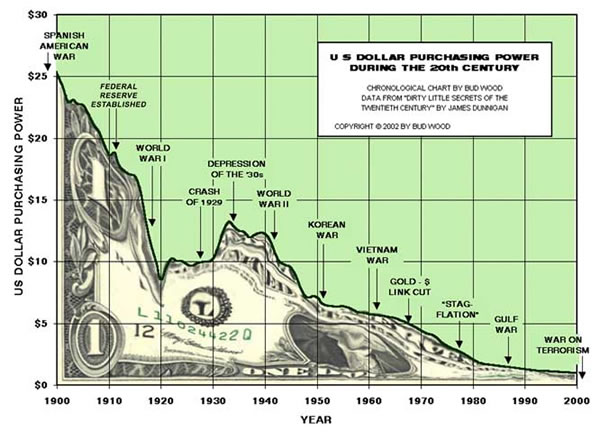 More likely is that the decline in the value of the dollar is attrributable to the changes that have occurred in the underlying economy of the United States and the World. 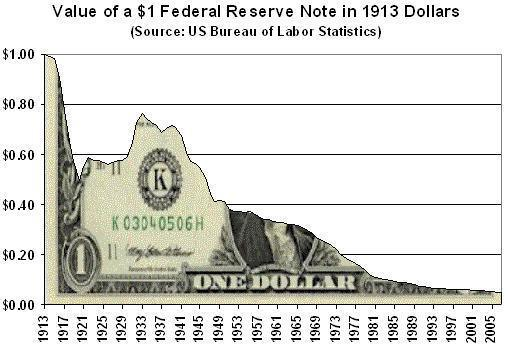 There have been substantial drops in the value of the dollar during the First World War and the Second World War. In both cases there was massive 'inflation' caused by excessive demand for war materials ... demand pull inflation and related production profits. 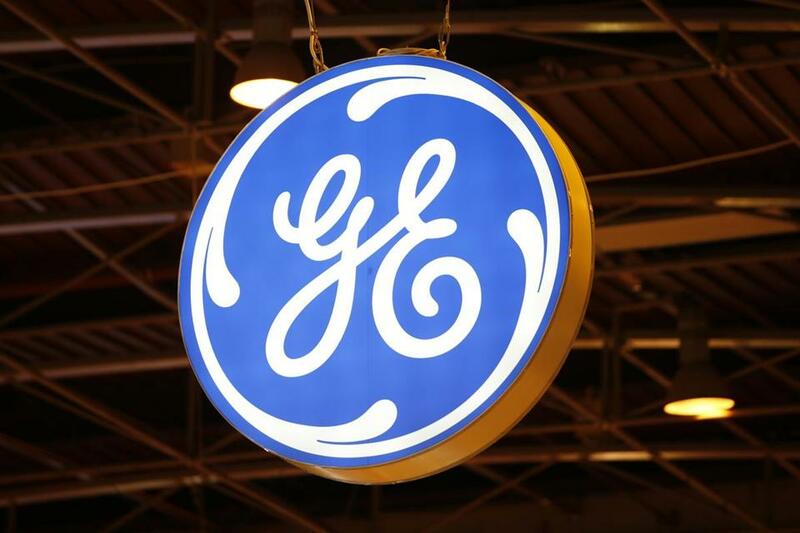 Global production profits have continued to fuel demand pull inflation since the 1980s. 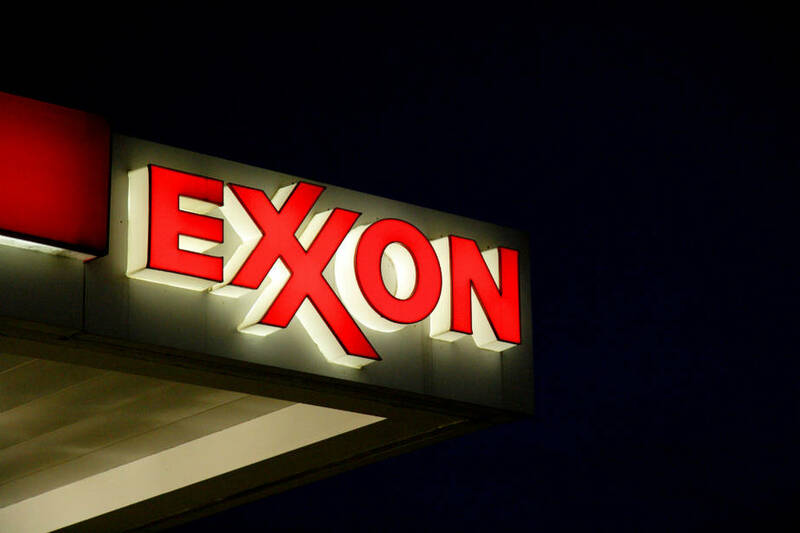 During the 1970s following the global 'oil shock', there was cost push inflation. 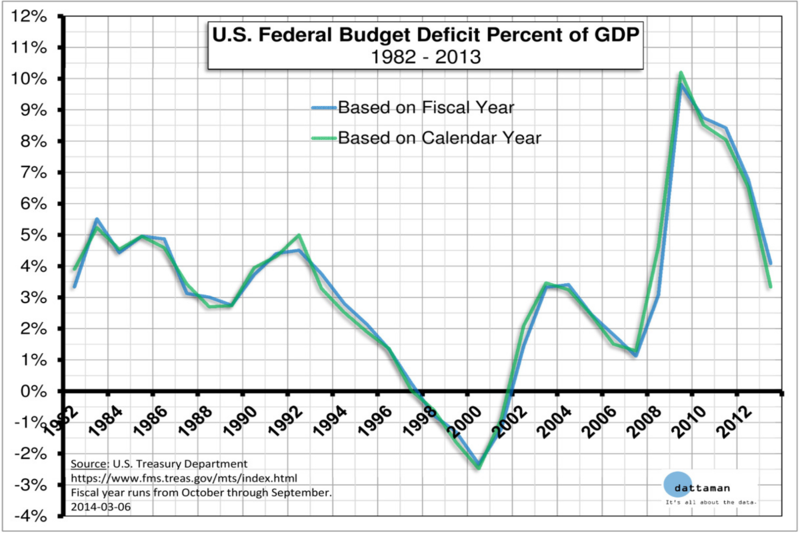 In the 1980s and the early 1990s, that is during the Reagan years and into the Bush senior years there were US Federal Government deficits. These came down during the Clinton years and the dot com boom and there were a few years of Federal Government surplus. This ended in the early Bush 43 years not helped by the Bush-Cheney-Rumsfeld-Rice post 9/11 war on terror, and then aggravated by the financial crisis of 2008. After the huge deficit of 2009 rhe Obama administration reduced the US Federal deficit substantially and set the stage for more fiscal sustainability in the future. Post Obama, government spending once again seems to be out of control with expanding deficits caused primarily by expanding military outlays and corporate tax reductions.